"Another employee informed me that they do not receive bonuses but will receive write ups and threats if they forget to ask each customer who enters their stores if they want a flu shot," says blogger Aydan in Oak Park, California (http://aydansrecovery.blogspot.com/2010/10/v...). "A Walgreen's employee who checked me out yesterday asked if I had gotten my flu shot," reports another NaturalNews reader. "I said no. She pressed me to get it. Then, she added that their entire staff was going to be rewarded with iPads when they met their quota." CVS pharmacies also appear to be using employees to push flu shots: "I work for CVS and they are making us wear shirts that say get your flu shot today, and [they give a] 50 dollar bonus for whoever has the most sales. I hate my job..." says another NaturalNews reader. I called Walgreens media relations department to ask whether this pushing of flu shots onto customers was a corporate policy. There, I spoke with Robert Elfinger, a media relations representative for Walgreens. He said he was unaware of any corporate policy asking employees to verbally promote vaccines. He also stated he was unaware of any complaints from customers about Walgreens employees wanting people to get flu shots. So this is neither a denial nor a confirmation of anything; it just says that the Walgreens media relations department isn't aware of any of this. Let's get 'em in the loop on this, shall we? A lot of people are not happy about how they are being treated at the Walgreens checkout counter. 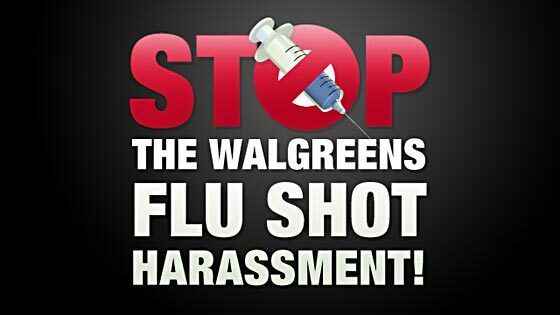 Some Walgreens stores are reportedly getting very aggressive with their pushing of vaccines onto customers, so we have decided to launch a public complaint campaign called Stop the Walgreens Flu Shot Harassment! Also, remember that if you submit your email address to Walgreens, they will have your email and they might theoretically use it to email you things like flu shot special offers, for example. So I encourage people to use anonymous emails or "throwaway" email addresses acquired through services such as Hotmail or Yahoo. Of course, the best way to protest all this is to just don't go to Walgreens or CVS. Don't give 'em your business and maybe they won't keep cropping up on every street corner like Big Pharma superweeds. What's wrong with flu shots anyway? Flu shots kill children. They maim little kids for life. They cause chronic neurological disorders. Even the Finnish government has openly admitted that flu shots cause these problems (https://www.naturalnews.com/033816_swine_flu_...). The U.S. government admits it, too, through payouts of its Vaccine Injury Compensation Program. At the same time flu shots cause serious damage or even death to those who receive them, flu shots don't even work to prevent the flu! They are based on outright scientific fraud and are never tested in a randomized, double-blind, placebo-controlled study before they are unleashed upon the public. When Walgreens sells flu shots, it is selling an experimental drug that has never been proven safe according to any truly honest scientific standard. Beyond all this, even if you somehow think vaccines actually work, vitamin D works far better at preventing colds and influenza infections. I take 10,000 IUs of vitamin D a day. I get absolutely no vaccine shots and take no medications. And yet I hardly ever get sick. Gee, I wonder why? Maybe it's because I don't poison myself with vaccines and toxic pharmaceuticals. Flu shots are the snake oil of our modern age, and flu shot promoters are quacks and hucksters who must by now fully realize they are killing little children (but they don't seem to care as long as they keep making money from it all). It is unknown, of course, how many children have been murdered or maimed by the vaccine industry. We do know that Pfizer conducted illegal and deadly medical experiments on children in Nigeria (https://www.naturalnews.com/023654.html). We know that the grandfather of the vaccine industry, Dr. Jonas Salk, was an unindicted medical criminal who engaged in heinous crimes against humanity (https://www.naturalnews.com/031564_Jonas_Salk...). We know that Dr. Maurice Hilleman, a top Merck vaccine scientist, openly admitted that vaccines contain "cancer causing viruses" and up to 40 mystery strains of viruses that were never identified (https://www.naturalnews.com/033584_Dr_Maurice...). We also know that even as children keep dying from vaccines, companies like Walgreens are happy to keep selling vaccines. And these popular pharmacies like Walgreens and CVS drape their vaccine promotions in the symbolism of compassion and health, with little hearts and smiley faces, to imply that vaccines are good for you. What they're really good for, though, is Walgreens corporate profits. About 30 percent of a vaccine's price is pure profit, meaning that Walgreens profits roughly $10 from each vaccine sold. Almost everybody knows the health care industry today has devolved into nothing more than a greed fest. Most people have figured out by now that the cancer industry doesn't really want to cure your cancer. The diabetes industry isn't really interested in curing your diabetes. Pharmacies sell products that, for the most part, simply don't work to prevent or cure any disease at all. The vaccine industry, like any other industry, wants repeat business, and that's exactly why vaccines have been found to contain live viruses that actually cause the very infectious diseases they claim to prevent. Vaccines are a hoax, my friends. They are founded on fraud. They are deadly poisons backed by nothing more than corporate-funded hucksterism sold as "science." But it isn't science. It's just for-profit propaganda. And if you're tired of this propaganda being pushed on you, stop spending your hard-earned dollars at retail establishments that promote and sell vaccines. Boycott Walgreens. Boycott CVS. Boycott the Safeway stores with pharmacies inside. Boycott the Wal-Marts. Send a message with your own purchases that you will not economically enrich those corporations engaged in selling products that maim and kill little children. And avoid vaccines yourself, too. After all, if you really want to survive the next real pandemic, you'll need a healthy immune system that can function on its own, not one that has been weakened year after year with injections of chemical adjuvants such as aluminum, which is found in the vast majority of vaccines sold in America today.